Hello folks. 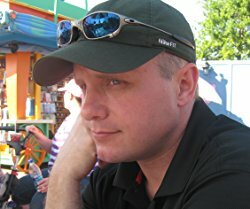 We’ve got an interview with Eric K. Barnum, the writer of the Dar Tania books and the Forsaken Isles series. He’s written a follow-up to Dar Tania—Set’s Dream—and we’ve been given the opportunity to talk to him about that today. If you’ll recall, we also had an interview with him a few months back, so make sure to check that one out for even more of an insight into how he works and what his books are about. Tellest: Hey there Eric. Welcome back. It’s only been about three months, but you’ve done a lot in that short time, and we’re glad to have you here again. We’ll get right into things this time around, as I’m sure there’s plenty we’ll have to talk about! First up: Set’s Dream follows an unlikely pair, Syliri and Bruce. Bruce is a badass ranger, which is a cool enough character in its own right, but Syliri takes the cake. She’s a medusa, which in your world is not a single, rare occurrence, but an entire race. She’s got the whole head of snakes and everything. But the most interesting thing about her is that she’s one of the primary protagonists in this tale. Did you find it challenging at all to write about someone who is not only such an uncommon character, but one also predominantly shown as a villain? Eric K Barnum: When I began outlining the Forsaken Isles, and what a dragon-led empire might look like, I realized we have all these tangled mythologies and monsters. Let’s be real. If a medusa existed in actual human history, she would have won. There’d be no humans left. So, yes, starting from that perspective, it’s difficult. In shaping the world though, I began to consider… “What if, in the monsters’ minds, they aren’t monsters? 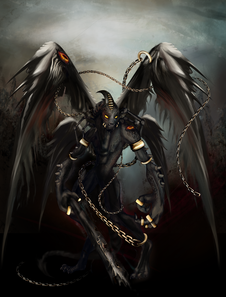 Humans are the monsters?” Good, evil, it all gets a bit subjective in my stories. It had to make sense though. The red dragon Alerius theorized that perhaps the medusa began as dragons with a petrification breath, and somehow got stuck in a non-dragon form. After all, they have a power every bit as devastating as a breath weapon. They have a kinship with serpents. From there, Syliri was easy. The real challenge with her was finding motivations for her to care, believably, about a mortal. Here’s Syliri. She’s intense and my illustrator Darko nailed my vision for her. T: I love the interpretation of her here as well. She’s not quite the Greek mythological take on a medusa. You’ve certainly given her your own twists and tweaks. Even her snakes have a personality of her own. It must have been interesting to romanticize someone like Syliri—she’s certainly no small part of this story. EB: The story follows her like a main character. She’s important to how Morbatten understands Set’s Dream while also offering a different-than-the-dragons view into the Eldar. 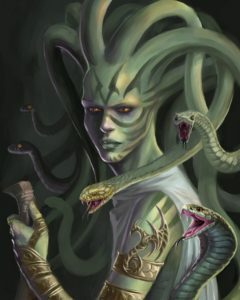 The actual Greek mythology of Medusa is tragic, dark, and capricious. I wanted Syliri to acknowledge this while also providing a bridge away from the crazed medusa monster that pops up in movies and tv shows. Making her romantic, making her live, giving her reasons to love Bruce was 80% of the fun in telling this story. It’s also important to me that women have strong roles in my books. It’s fantasy after all. Morbatten serves a Goddess. 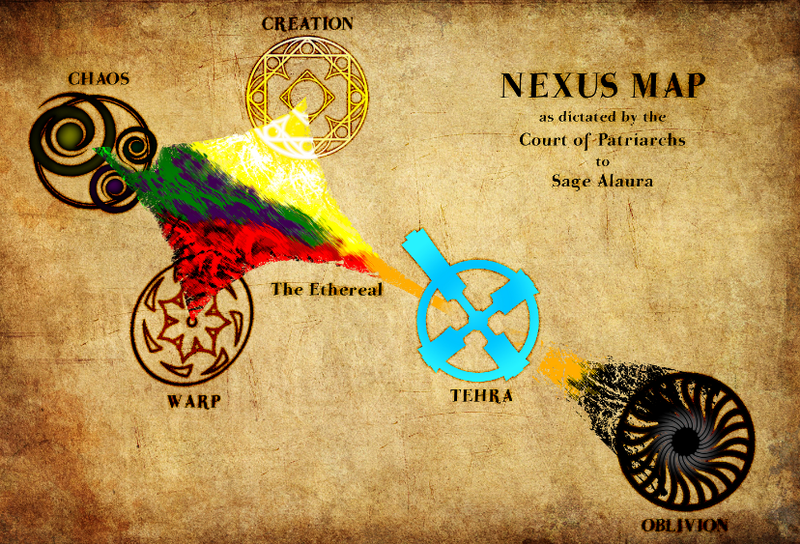 The Temple, essentially their government, is headed by Dar Tania. Compelling, important, and powerful are the key words I put into my mind when writing characters like these. T: With the traditional medusa mythology, you needed to make eye contact with the creature in order for her to enact her dreadful magic. Not so for Syliri, whose petrifying gaze can take hold even if you were blind. 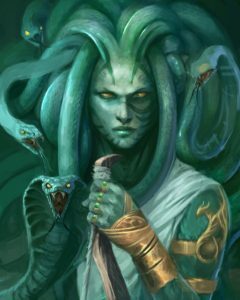 We talked about the mythology of the medusae once being dragons, but did you ever consider reining her immense power back a ways? EB: The eldar had incredible power; what they thought became real. Their will gave it form and duration. 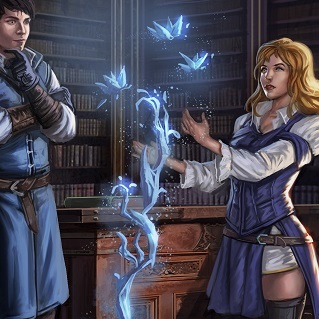 Syliri though became part of Set’s Dream against her will. Like those drawing on the Dream, the paranoid corruption of it has an addictive component to its use. Syliri has to self-limit, and like a recovered addict understands that “not at all” is the safest way to go. The self-control rings gifted her by Alerius help too. But, yes, Syliri is every bit as powerful as an unascended goddess of the medusae should be. T: Taking a step back to what you mentioned of the monsters not viewing themselves as monsters, we’re seeing a lot of this in fantasy right now, though perhaps not quite to the extent that it’s presented in your books. Grey fantasy is kind of a popular trend, where you see everyone’s point of view, instead of just who we consider as the heroes of the stories. Syliri is kind of in between, too. She’s fighting her nature every step of the way. Did you find it challenging to create a character who is almost like this ticking time bomb in a way? EB: Syliri isn’t the only one. The hill giant, Fist of Graves, serves as another counterpoint to how Set’s Dream makes monsters monstrous. I know what you’re talking about and wanted something different. If you presume a world of magic and monsters, you have to be open to how and why they exist in the world. 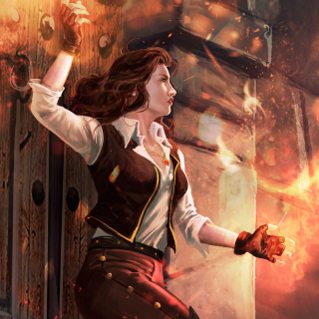 The trope of mage-experiments or magicked-genetics is <yawn> not really my thing. Monsters exist in the Forsaken Isles because they were eldar and fell into Time or because Set dreamed them. The paranoid strength of Set’s Dream puts them in a different experience than sentient/divinely-protected races. Set’s Dream is why your favorite pet cat occasionally claws the heck out of you, or a pet snake kills its owner; they don’t see the same world we do. If you can pull them free of Set’s Dream, they start to become sentient. Here is a picture of the author, Eric K Barnum, deep in contemplation of Set’s Dream. T: Another big surprise is the introduction of the Slaadi as your antagonists in this tale. You can see them in a lot of pen and paper RPGs, but they’re usually shrugged off as fodder enemies. They’re not presented that way in your books though—they’re a big deal. They reshape reality. How did you determine that these were your bad guy’s for Set’s Dream? EB: It’s exactly what you said. No one has ever done the Slaadi. I wanted to do them justice and give them a reason to be more than fodder so that they would have their own mythology. In Dar Tania 1, I introduced this notion of Set’s Dream. That is, an abyssal god able to reshape reality. Because sentient creatures in my writing can worship and empower gods, I thought, “What type of sentient race would worship someone like Set?” The answer: the Slaadi, the Hags, the twisted and misshapen things that go bump in the night would bend knee and hail Set. T: Their relationship to Set is a lot different than, say, Dar Tania’s relationship to Tiamat as well. They may very well worship the Dreamer, but in a way, it’s almost like they’re trying to get one over on Set as well. It’s certainly a different kind of worship than you’re used to seeing, and not one I think you’d ever see a human try to get away with. EB: It is a trope throughout media that you have some crazy villain who wants to awaken some dire power and then, boom, they get what they deserve. “Oh, you literally want to kill everyone, even me.” Villain dies horribly. Tiamat nourishes Dar Tania because the god-faithful bond gives power to each. My blog explains this in more detail, but it’s essentially a Greek pantheon dynamic. Before Set was bound, he created the Slaadi and gave them power to tap into his power. Because Set is now trapped in slumber, the Slaadi need to stir him from sleep to gain more power. Unlike Dar Tania, there is no love, no trust, and no hope for afterlife. Set worshippers must make their own way and the Dream gives them the possibility to succeed… if they can intrude into Set’s mind. T: You’ve also done some other really cool things with the dimensional travel. The world you’re building is robust as anything. For instance, the Slaadi are after gold because it retains its properties across the various dimensions. How did you come up with that? EB: My blog at darmalcor.weebly.com goes into this in a lot more detail. The easy answer is that I want to have extradimensional beings in my stories and so needed to build it out and show the rules by which travel happens. If you take concepts all of our world’s religions embrace, like divine omnipotence, and challenge it with “magic”… something has to give. In a polytheist religion, how would poly-omnipotent beings interact with each other, especially in conflict? Is there a strongest? My answer was that each such being is omni-everything in its own throneplane. As they move away from it, they weaken. Because magic is inherent in the Forsaken Isles, I chose gold – for all its many symbol-worthy attributes – as also being able to hold magic when moving from realm to realm. This map shows the high level of how it all works in the Forsaken Isles. T: Of course, every awesome group of opposition needs a cool boss, and with that, we’ve got Ylgolth, the Grey Slaad. He’s a pretty big deal, and it ties directly into Set’s Dream in a big way. Without spoiling too much, what can you tell us about him, and how you determined he was going to be an important part of your story? EB: The only way a race like the Slaadi could exist, without consuming an entire world, is if they self-regulate somehow. Their prime directives create an interesting way of “learning.” As they grow in power, they get to a point where it’s actually easier to eat the brain of the creature they need to learn from than to sit through instruction. Wouldn’t it have been nice if, in school, the teacher said, “You know what? Forget this… here’s some of my brain. Eat it and you’ll know what you need to know about Chemistry.” Ylgolth needed to suggest and embody the entire race in a way that did not bring Morbatten into conflict with the entire race. In Dar Tania 1, the Prophecy of the Spear and Shield points Morbatten directly at Set. Ylgolth, like all Slaads, needed to show an enemy for Alerius and differentiate the growing mortal might of Morbatten. In this way, Ylgolth took shape. He was really fun to write. 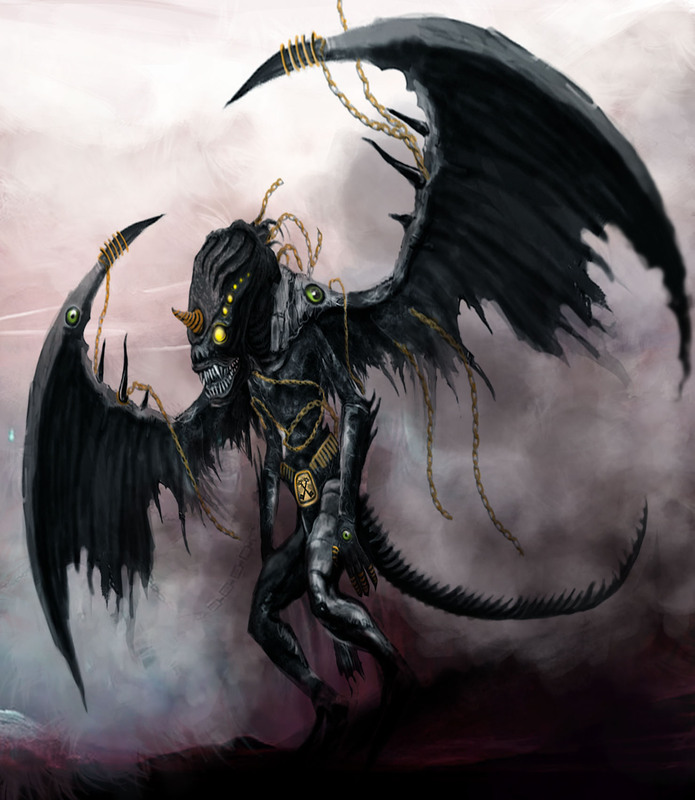 T: So, assuming the Slaadi take a back seat in Dar Tania 3, do you have any hints as to what might be the new face of the enemy that the Tanians are going to have to confront? 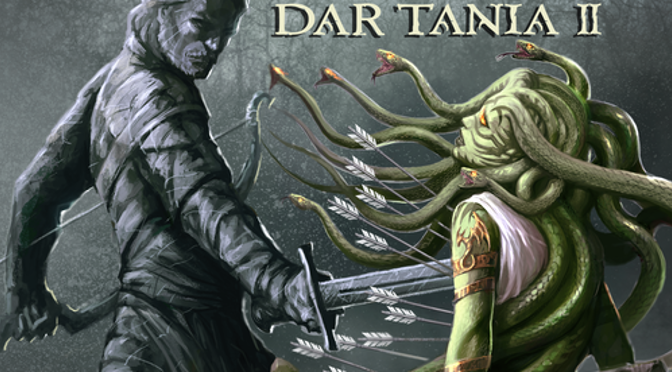 EB: The Tanians are driven by the Prophecy of the Spear and Shield told in Dar Tania 1. They seek out enemies and, while not “good” the way King Arthur or our world would define it, they define their goodness as a function of their opposition to evil. And, the inherit the enemies of the dragons ruling over them. 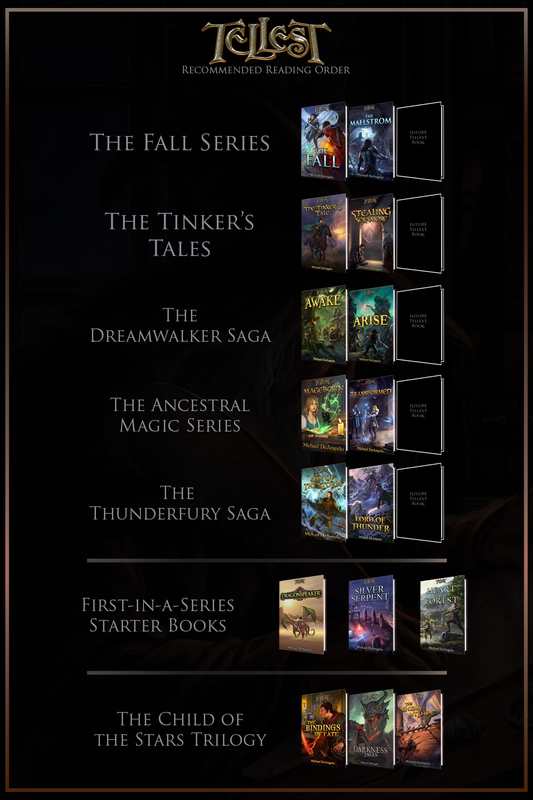 The other books feature villains of the normal thief gang variety, liches, the entire scale of necromantic creatures, and more. In Dar Tania 2, the god emperor has the new paladins slay their life’s regrets. Only 5 years have passed but so much has changed. Not everyone has Tiamat helping them cope with this change. Not all the nations around Dar’s people are okay with what is happening. T: Ideology is also a very important part of your writing process. Dar Tania was the High Priestess of Tiamat, but we’re obviously looking at a different theological power this time in Set. What makes Set and his followers different, and how much of a problem for the rest of the Forsaken Isles is that going to be in the future? EB: Unlike every other god, Set wants to consume all that is. 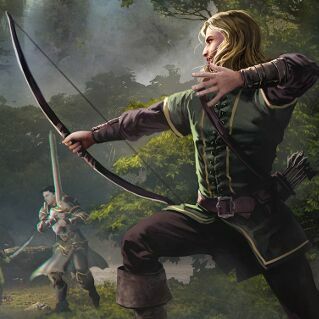 When Syliri asks Ylgolth’s disciple Hrax what he wants, Hrax says, “All that is mine, and more.” This is Set’s motto but he would say, “All that is, and more.” With Set, there is no negotiation, compromise, or even rational defense. What Set sees, he bends and warps. What Set touches, changes forever. What Set desires becomes reality. As such, the theology of Set, as shown by the Slaadi, is to consume life and throw it at one’s enemies. The disciples of Set, like the Slaadi, believe that the bigger the disaster, the more poignant the cataclysm, the more likely they are to be “seen” by Set in his cursed sleep… and achieve more power over Set’s Dream. Maybe, with enough destruction, they could awaken Set… and, in their theology, become gods after all is consumed into Set and the universe is Set. Dar Tania 2 also explores some other ideas, such as the nature of what a monster is, love between worshippers of different gods, loyalty, and the corruptible yet addictive nature of power. T: We had talked last time about how you had plenty of potential books to work on. What’s next after Set’s Dream? EB: By reader demand based on comments at my blog – darmalcor.weebly.com – and emails, I’m going to pick up the story of the Forsaken Isles following Bomoki’s Gate… some 1800 years after Set’s Dream, or what I would consider “modern” time in the Isles. With the fall of the God of Necromancy, the Abyss is in even more chaotic turmoil, and it’s time for the thieves to step up their game. 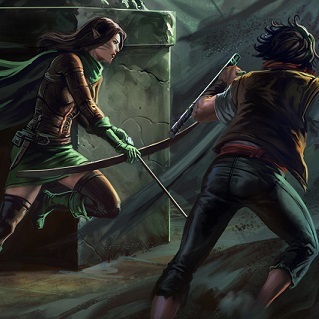 While Morbatten’s Thieves Guild operates more like the CIA, the other societies around Morbatten have more gangster-type groups and the God of Necromancy is decomposing over yonder in the Valley of Bloodstone. The characters from that book, namely Marcello, Khalla, and Ayden proved quite popular and so this next book will tell the tale of Marcello assembling a team to go back to Merakor as the first Tanians to do so in nearly 3,000 years. Against this, the various Thieves Guilds will go to war and the nature of the Abyss will be rolled back to show what happens when a powerful dominion like Necromancy is suddenly vacated by its god’s death. T: Sounds like a lot is going to happen in that book. I’m sure it’s going to be a lot of work, but it’s going to pay off in some big ways! EB: You bet, Michael. That book should be available early 2018. It’ll be a full book and I may also release a shorter 100 page story about Malcor in this timeframe. After all, he just became king and all his heroes fell. It’s lot to take in and none of his accelerated combat and paladin training could help with the responsibility of being what Malcor would consider a good king. Moreover, he does not want to be king at all, but it’s hard to say “no” to a dragon. Barnum has been on an incredible run this year, and it doesn’t seem like he’s showing signs of stopping. With a handful of great books already, with more on the way, he’s definitely an author who you should have on your watch list. Once more, his blog at darmalcor.weebly.com currently highlights a lot of the interesting things he writes about. 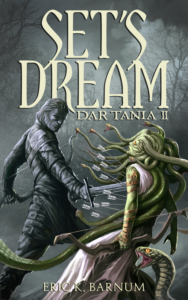 Also, don’t forget to check out Dar Tania 2, Set’s Dream, now on Amazon.